North Coast Repertory Theatre seems intent on recapitulating my life this season. First they disinterred the Sisters of Charity from my grade school in Doubt, although the sight of a forelock peeking out from a stage nun's bonnet was surprisingly scandalous. We used to wonder whether nuns even had hair. It seemed possible the Sisters were generated by some primitive form of papal hydroponics. Now North Coast Rep presents Over the River and Through the Woods, a comedy by Joe DiPietro, whose book for the musical Memphis won the Tony this year. 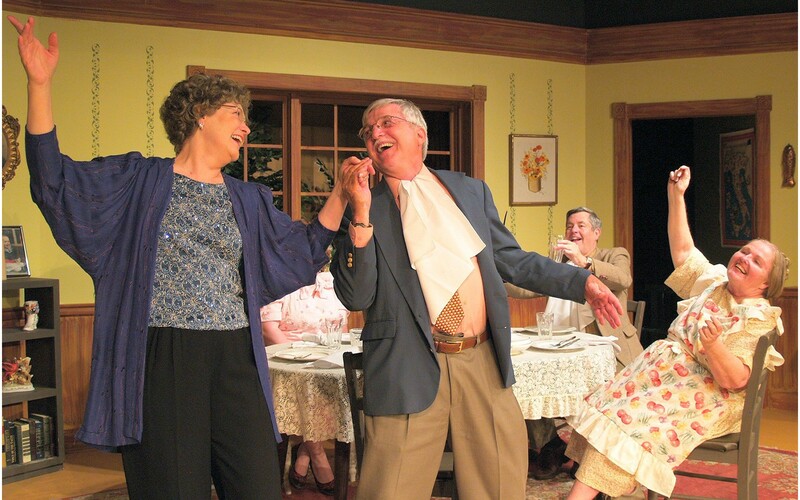 The play is about a grandson who dutifully dines every Sunday with all four of his Italian grandparents, and has to decide whether to move 3,000 miles away to pursue his work and an independent life. Despite the last name I inherited from my father, I was nurtured by my mother's family and relations, most of them born in mountain towns of the Abruzzi. For a while I apparently understood and spoke Italian and English equally, though my bilingual skills declined once my vocabulary exceeded 100 words. Given this background (though in western Pennsylvania rather than the New Jersey of the play), I was frankly most worried about cliché and stereotype. So in an odd way I was relieved that the only element of the set I recognized was the afghan, similar in pattern to the one my grandmother made for me, which I can at this moment see if I turn my head to the right. DiPietro's script included some historical references worth making, even in a comedy, such as the prejudices Italians faced. (During World War II, Italians in Arcata were not permitted any closer to Humboldt Bay than the hill where Wildberries now stands.) But most of all I was grateful for a couple of outrageously rare hours about Italian Americans with not a single reference to the Mafia. Though I don't recall ever hearing anyone utter the play's mantra, tengo famiglia (literally "I have a family"); the particular ties and tensions of the Italian family are, well, familiar. Judging from the audience's responses at Friday's performance, much of the gentle but pointed family byplay is universal enough to be ruefully recognized and funny. I expect the grandparents' incomprehension of just what the grandson does (he's in marketing) is widely generational. Despite some excesses, DiPietro's script is witty, generous and evocative. Evan Needham plays the uneasy ambivalence of grandson Nick with skill and the necessary charm, and Brittany Morgan Williams hits the right notes in the small but important role of Caitlin, the girl the grandparents hope will tempt Nick to marry and stay. But the evening belongs to the grandparents, played with both brio and delicacy by David Simms, Laura Rose, Lou Agliolo and Linda Agliolo. Even with some wandering accents, they make it all work by creating distinct characters as well as an overall portrait of a generation that began in Italy and finished their modest and admirable lives in 1980s America. Pace, timing, movement, expression -- all the elements are harmonized in Rae Robison's direction, achieving an evening of laughter and emotion. Jenneveve Hood designed costumes, Daniel Lawrence lighting, Rae Robison the scenery. Over opening weekend, the assistant director officially changed her name to Megan Johnson. Felicitations to the former Megan Hughes and to Calder Johnson, both active in a number of capacities for several local theatres, who were married on Saturday. Over the River and Through the Woods plays at the North Coast Repertory Theatre in Eureka weekends through August 12. On a less happy note, North Coast theatre is losing two theatre artists married to each other who have made substantial and unique contributions over a number of years here. Together, director Dan Stone and actor Tinamarie Ivey founded Sanctuary Stage and managed programs at the Eureka Theatre. They created a number of theatre projects that included community participation, and last summer were instrumental in bringing in L.A.'s celebrated Cornerstone Theatre to produce Jason in Eureka. They are also dedicated educators. Among the memorable theatrical moments they've left me are Tinamarie's solo performance in Bad Dates at the Arcata Playhouse (via Redwood Curtain), and Dan's production of Memories, for which he fashioned a script from existing and community-generated material, and (as he often did) created the music. There are few directors locally who work with the kind of plays Dan did. I'll also especially remember getting a whole new idea of commedia dell'arte from a Sanctuary Stage performance for Sunday brunch at an Arcata restaurant, for which I was pretty much the entire audience. Dan and Tinamarie are relocating to Oregon. We note this transition with sadness and gratitude, and send our best wishes for their future. Also moving to Oregon is another couple active in North Coast theatre lately: teacher/writer/actor James Peck (he was Leonard Bulge in Blue Lake: The Opera) and actor Sarah Peters. Sounds too much like a trend. Coming Up: Ferndale Rep opens the musical Rent on August 5.